Committed to providing a multi-stakeholder platform to discuss issues relating to Internet governance, human rights online and the future of the Internet, the third Digital Citizen Summit (DCS) was organised on November 1-2, 2018, in New Delhi. India and other South Asian countries have made leapfrogs in the technology sector to adapt to digital lifestyles. In recent years, there has been a disturbing trend towards mass surveillance by government agencies, the invasion of privacy, and acts to curb free speech online. Digital Empowerment Foundation (DEF) organised the first DCS in November 2016 to address these issues. The key objective of the summit, since then, has been to generate actionable policy-based recommendations and lay down steps to proliferate digital inclusion and promote human rights online by inviting scholars, researchers, academics, civil society organisations and government representatives to engage in a dialogue through presentation of papers, participating in sessions, organising workshops and striking conversations at the summit. 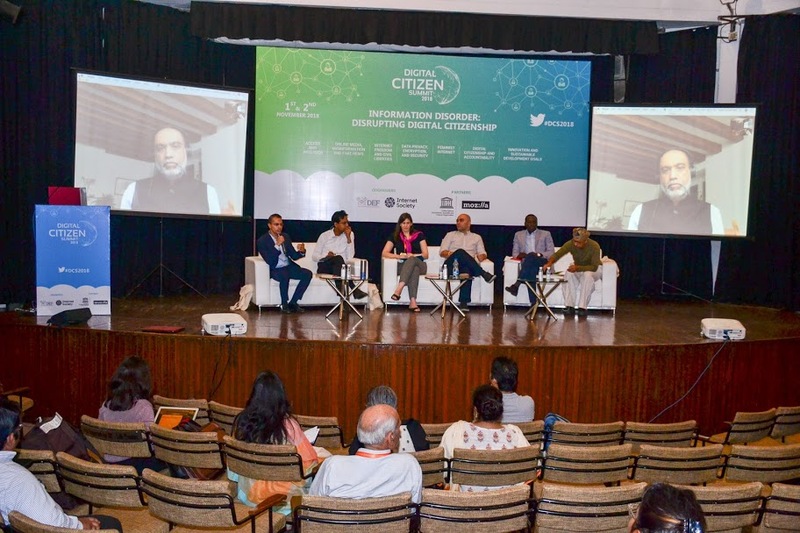 Taking this idea forward, the third DCS was opened with a panel on ‘Information Disorders: Disrupting Digital Citizenship’. Moderated by South Asia Editor for Asia Times, Saikat Datta, who opened the house by underlining the impact of technology on productivity while reducing the number of jobs, engaged the panelists in a discussion on priorities when it comes to the Internet. Joining Datta on the panel were Regional Director (Asia-Pacific) at the Internet Society Rajnesh Singh, Adviser for Communication and Information (South Asia) Al-Amin Yusuph, Founder-Director of Internet Democracy Project Dr. Anja Kovacs, Executive Director at Internet Freedom Project Apar Gupta, Executive Director at the Secretariat of the High-Level Panel on Digital Cooperation Amandeep Gill, Founder Director of Digital Empowerment Foundation Osama Manzar. Reminding people of the agency of developing content, Gill added, “Halloween is increasingly being celebrated by affluent children of South Delhi, however, the day has no cultural context for them. This is because of the over-representation of one culture of the other.” This becomes extremely pertinent for a country like India where languages, culture and traditions changes every few miles. Reflecting on overrepresentation of one culture over the idea, the panellists agreed that the Internet is making humans the some total of their data, which is being controlled by someone else. “So where should the data reside, according to the rights perspective?” Datta asked? “Access in itself has no value, the question is access to what. There is so little agreement on the topic of data. Should consent be part of the framework? But what is data? If you look at the Data Protection Bill, it views data as a resource or oil, which is up for grabs. It’s pretty similar to how western countries used to think of colonisation. Data is there to be mined and exploited. However, the Internet Democracy Project looks at data as an extension of your body,” said Anja. This linguistic gap is evidently visible in India where 70 per cent of the unconnected lives in rural India and lack understanding of the English language, the dominating language of the Internet. But every new mobile phone connection, every new technology, is a building block in the changing economy. “Are you seeing a monopolisation of data? Is that a function of economic power because tech leads to better economy?” Datta asked.